Defined contribution (DC) retirement plans are often misunderstood to be tax-free, when in fact they are tax-deferred. There’s a big difference between a tax deferral and a tax deduction or exclusion. 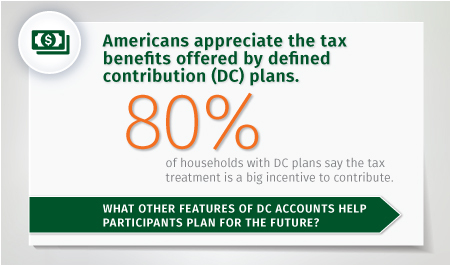 What’s not misunderstood is the value of tax incentives to encourage retirement saving: in a recent ICI survey, nearly nine out of 10 DC–owning households said that the tax treatment of their retirement plans was a big incentive to contribute.